Blu-ray Release: I Want to Live! The 1958 drama I Want to Live! tells the brutal true story of a brazen bad girl (Susan Hayward, who won an Academy Award for her performance) who is implicated in murder and sent to death row, where she awaits the ghastly inevitable while a journalist (Simon Oakland, Psycho) wages a campaign to save her life. 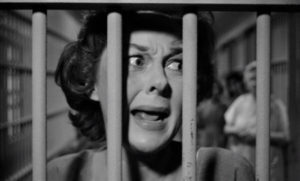 Susan Hayward in I Want to Live! The singular Robert Wise (West Side Story) directs with almost unbearable, utterly brilliant tension. Highlighted by a jazz score from Johnny Mandel, available on this Twilight Time release as an isolated track.